Procrastination is a time sucker. It’s also a very common problem amongst graduate students. We may claim that we work best under pressure, but the truth of the matter is, the quality of our work suffers. And just like with any other problem, the first step to recovery is first admitting we have a problem. 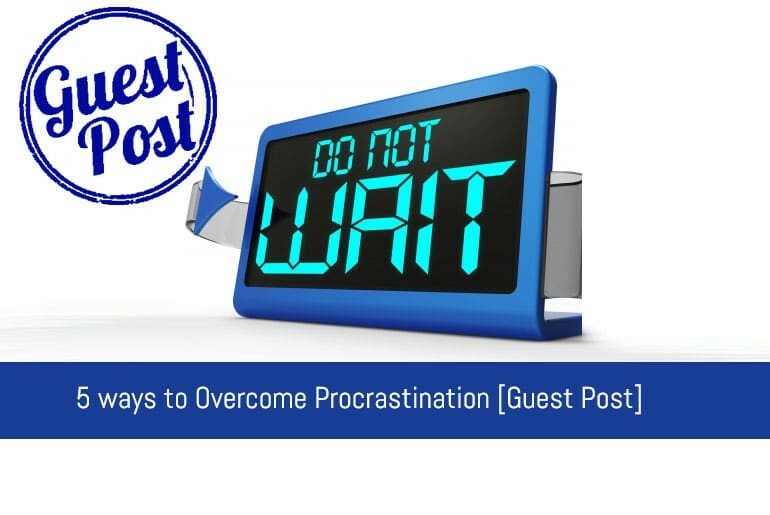 Let me lay out five strategies to help overcome procrastination. I’ve always believed that how we start the day sets the pace for how the rest of the day turns out. Sometimes procrastination happens because of a mere lack of energy and focus. The problem of energy could be remedied by getting 8 hours of sleep, having a healthy breakfast, and getting some exercise done. The focus issue can be solved by sitting down with a journal and planning out the 3 MIT’s for the day. Yes, engineers like myself like the term MIT because of the institute it refers to, but I’m not talking about Massachusetts Institute of Technology. I’m talking about the Most Important Tasks as defined by Leo Babauta in Zen Habits. Overflooding our to-do list with fifteen tasks mentally sets us up for failure, so we end up thinking, “We’re not going to get all of that done, might as well watch this cat video on YouTube.” Having a to-do list that is limited to three main tasks makes it feel do-able, so it amps up our motivation to get started. Procrastination occurs when we are supposed to do an unpleasant task, so we are mentally wired to put it off as much as possible. So in order to help work around that, it helps to divide the MIT’s into smaller tasks and tackle each one per work session. The Pomodoro technique can be used to divide our workdays into 30 minute sessions where 25 minutes are used for focused work and 5 minutes used for a break. When it comes to work, we know that sometimes the hardest part is just getting started. If we overcome that initial inertia, maintaining momentum becomes easier. So it would help if we streamline the starting process. For instance, we can have the desk organized at the end of each day so it becomes easier to start the next day. If the unpleasant task you’re supposed to do is exercising, you might try to keep your gym clothes ready the night before so it’s easier to go out for a workout in the morning. We’re social creatures, and for some reason, we’ve come to believe that the more we complain, the more others will connect with us, because after all, misery likes company. Sometimes we end up so much time complaining about how much work we have to do, complaining turns out to be nothing but a procrastination technique. However, if we just invest that time and energy on getting the work done, we’d have less to complain about. We all know the internet is the black hole of the new era; its gravity is so strong it prevents us from escaping. One website links to another and another and another….and four hours later we snap out of it and wonder where all the time has gone. And maybe it all started innocently with work-related video and somehow ended up watching a video on how to make Pasta. So, block YouTube and/or disconnect the internet if you don’t need it for work. Again, remember that the maintaining momentum is easier than overcoming inertia, and it works here as well. When it comes to these distracting websites, the trick is simply not to start. So which method would you try to overcome procrastination the next time your brain is resisting doing productive work? Tweet me the answer @ahechoes.